In a nutshell, Dani Steele is not at all satisfied with her life. Her two sisters are ridiculously successful, her mother is a complete nutter, her boyfriend is just a step above a cave man, her job pays the bills and that’s about it, and her acting career is going nowhere. Though Dani appears happy on the surface, she pours out her true feelings into her journal/diary which she has, since the age of 12 written in the form of letters to her hero, Dwayne “The Rock” Johnson. Through thick and thin, The Rock has been there for Dani, “hearing” all her woes, “listening” to all her hope and dreams, and “sympathizing with” her issues and feelings about the people and events in her life. While Dani accepts she will only ever admire The Rock from afar, Fate has other plans for her life and with the proper alignment of the stars, Dani comes across an opportunity that would allow her to meet her hero. All she must do is compete in an obstacle course competition and win her age group! Um, what?? Excuse me?? Yeah, Dani has never run a day in her life so winning this thing is going to take some serious commitment and the help of one miraculously beautiful trainer, Marco. With absolutely no idea what she’s really getting herself into, Dani signs up for the event, contracts with Marco for personal training, and launches herself into a series of weeks and months that will test her both physically and emotionally. Though Marco is miraculously beautiful, he is also a slave driver when it comes to fitness. In addition to the physical workouts, Marco also instructs Dani to radically alter her eating habits. What. The. Actual. Hell. No more fun pastries with her work friends, no more pizza, no more fast food, just smoothies and vegetables, and smoothies, and infused water, and smoothies!! 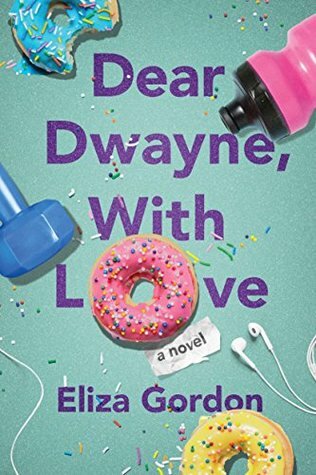 The struggle is real and while Dani has chosen not to share her fitness journey with her friends, she has chosen to share it, and all the other annoyances in her life with The Rock in her diary, a tome she never, ever, in the history ever expected anyone other than herself to read. Enter stage left, the hacker with a mean streak . . . . . The Bottom Line: I should have known, given how much I enjoyed Must Love Otters, that I would love this book too! My favorite part of this book, without doubt is all the conversation. I am such a fan of dialogue and this book is filled with witty, sarcastic, funny dialogue that comes in all shapes and sizes. For example, Dani not only communicates with others in real life, but also has her written diary which is written in a letter format, and her inner monologue which is often a two-sided conversation with The Rock. All the conversation not only moves the book along but reveals what we are really meant to see, learn, and know, that is, how Dani evolves as a human and how she navigates all the events, both good and bad, that happen in her life. Though this is a very funny read, it is also the story of a human being who is essentially a good person, but, like all human beings, still has things to learn in this life.